This tutorial goes through in detail, the steps to laminate carbon fiber onto the top and bottom of a skateboard deck. 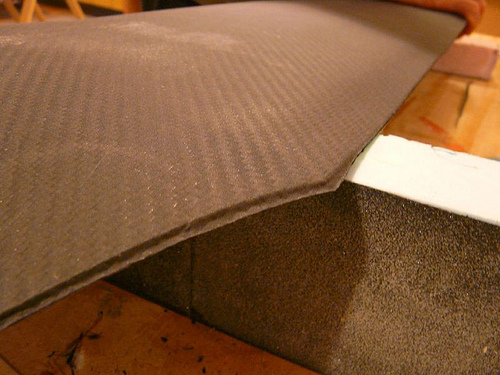 Please check out Cutting Carbon Fiber if you are not familiar with cutting this material before starting this tutorial. I am going to laminate two layers of carbon cloth, one on top and one on the bottom of a PINCHed drop board. The deck has to be sanded smooth (150 sandpaper) with no bumps or ragged edges. Below is the prepped deck. I have left all the edges sharp and not rounded. Pre-cut all the materials first. You need to have your epoxy, Thin Air Press and masking tape on hand ready to use. Making sure everything is ready is a must when working with composites. When epoxy is in mass, it heats faster than when it is spread thinly, so apply it to your project as quickly as possible. Do not let it sit for long in the mixing pot! Epoxy has to be measured properly, too much hardener and it will heat too quickly. Too little hardener and it will not set properly. The pumps are a good idea as they measure the epoxy precisely. Place the deck into the TAP bag. One way of doing this is to open the bag fully by blowing air into it with a vacuum cleaner. While standing on a chair, carefully lower your project from above into the bag which the other person holds open. Keep your hands clean during this step. Do not get epoxy on the sealing tape or close to the opening of the TAP bag as the sealing tape will not stick properly if even a small amount of epoxy gets on it. Use plain white vinegar to clean your hands (not the bag), it removes epoxy really well! In a couple of minutes, check to see if the vacuum is still holding tightly. If any air has leaked in, check and re-press the sealing tape first. The epoxy will start to harden in a couple of hours. Leave your project in the bag for at least 8 hours. You will need to peel away the release film and breather ply after removing your project from the TAP bag. This take a fair amount of pulling, and sometimes cutting along the edge of the deck. It is time to clean up the edges of the deck. A sharp utility knife works great. The epoxy/carbon cloth it is very sharp. Be careful! Trim as close to the edge of the deck as possible. Using a file or coarse sandpaper with a sanding block, remove the remaining carbon to the edge of the deck. It should look something like this when done. On the bottom, I later added a pre-preg carbon layer. I made this by laminating it on a sheet of glass. That is about all you need to know to laminating carbon fiber to a deck! Most of the work is in cutting the material and getting everything prepped.